Today we share our third and final pair of social media awards from CIRM’s 2018 SPARK (Summer Program to Accelerate Regenerative medicine Knowledge) program, a 6-12 week summer internship program that provides hands-on stem cell research training to high school students throughout California. 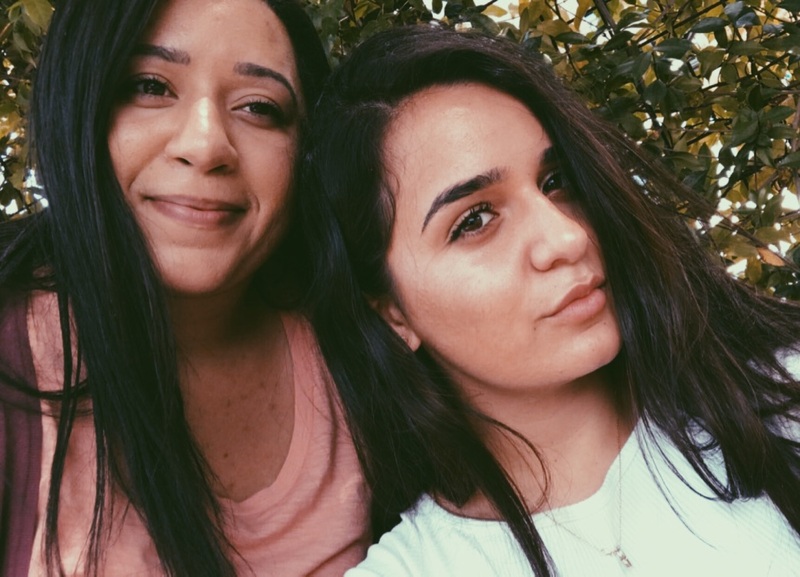 As part of their curriculum, the students were asked to write a blog and to post Instagram photos (follow #cirmsparklab) to document their internship experiences. Several CIRM team members selected their favorite entries and presented awards to the winning interns at the SPARK Student Conference earlier this month at UC Davis. My interest dissipated as I entered into my high school career. I was struck with incoherence, an inconsistency to my thoughts, as I leaned my shoulder against the wall—for I had already decided to let my fatigue to take over. I felt lacking, unconfident in my abilities even to solve a simple balance chemical equation in chemistry class. Science was not my forte. I could never see myself working in a lab setting. Still, a spark within me still held onto that childhood curiosity of mine. I remember sitting on the bus on my way to school reading about stem cells, which were fascinating to me. We can use these little cells for so many scientific research. studied the human-specific population of cortical neural stem cells and evaluated the signaling mechanisms that govern the formation of their identity. Through my performance, I am also contributing to this phenomenal study, helping my community by potentially providing information to help cure mental illnesses. At times, the results of our data did not come out as we wanted it to be. The staining went wrong, and the images were lacking. I would have to repeat the experiment or troubleshoot on the spot continually. However, it’s all a learning process. Even if I do get beautiful image stainings, I still need to repeat the experiments to confirm my results. Learning was not the only side that is needed under this program. CIRM encouraged us to share our internship experiences on social media. I posted once a week on my studies, what I’ve learned, and how I could teach my viewers about this new research I am performing. I remember in one of the first few meetings we had, where we had to share our research with our peers, “ I can actually understand your studies,” a friend of mine claimed. I felt powerful, in a sense, that I was able to communicate my knowledge to others to help them understand and teach my study. When I talk to my family and friends about my summer, I feel confident in my ability to comprehend these complex ideas. I could see myself researching, engineering, and fighting for a solution. I want to find the best form of gene therapy, and map each neuron of the brain. Through this two month program, science has become a new passion for me, a cornerstone of my new academic pursuits. It strengthened my theoretical knowledge and gave me an experience where I witnessed the real world laboratory setting. Not only did I learn the fundamental techniques of immunohistochemistry and microscopy, but I was able to receive encouraging advice from the scientists in the Kriegsteins lab and especially my mentor, Madeline Andrews. The experience in a lab comforted me by the idea of the never-ending changes that lured me to a world of thought and endless potential. Those students participated in a CIRM-funded internship called the Summer Program to Accelerate Regenerative medicine Knowledge, or SPARK for short, with seven programs throughout Northern and Southern California which include Caltech, Cedars-Sinai, City of Hope, Stanford, UC Davis, UCSF and the UCSF Benioff Children’s Hospital Oakland. 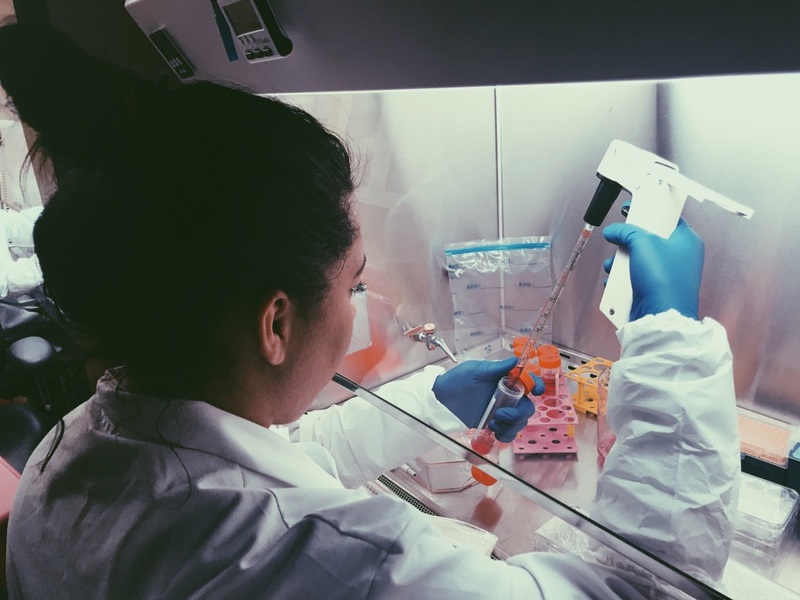 Over the course of about 8 eight weeks, the interns gained hands-on training in stem cell research at some of the leading research institutes in California. Last week, they all met for the annual SPARK conference, this year at the UC Davis Betty Irene Moore School of Nursing, to present their research results and to hear from expert scientists and patient advocates. As part of their curriculum, the students were asked to write a blog and to post Instagram photos (follow #cirmsparklab) to document their internship experiences. Several CIRM team member selected their favorite entries and presented awards to the winning interns at the end of the conference. We featured two of the winners in a blog from last week. My CIRM SPARK journey started long before I ever stepped foot in the Institute for Regenerative Cures at UC Davis. Instead, my journey started two years earlier, when my older sister came home from the same internship with stories of passaged cells, images of completed western blots, and a spark in her eye when she described the place she had come to love. Barely 14 years old, I listened wide-eyed as my sister told us about the place she disappeared to each morning, stories of quirky professors, lovable mentors, and above all, the brilliant flame that everyone in her lab shared for learning. But even as she told her stories around the dinner table, I imagined this cold place where my charismatic, intelligent, and inquisitive sister was welcomed. I imagined the chilling concentration of dozens of geniuses bent over their work, of tissue culture rooms where every tiny movement was a potential disaster, and above all, of a labyrinth of brilliant discoveries and official sounding words with the door securely locked to 16 year old girls – girls who had no idea what they wanted to do with their life, who couldn’t confidently rattle words like “CRISPR,” “mesenchymal” and “hematopoietic” off their tongues. In short, this wasn’t a place for me. But somehow I found myself applying for the CIRM SPARK internship. Seconds after I arrived for my first day at the place I was sure I would not belong, I realized how incorrect my initial assumption of the lab was. Instead of the intimidating and sophisticated environment filled with eye-rolling PhDs who scoffed at the naïve questions of a teenager, I found a room filled with some of the kindest, funniest, warmest people I had ever met. I soon found that the lab was a place of laughter and jokes across bays, a place of smiles in the hallways and mentors who tirelessly explained theory after theory until the intoxicating satisfaction of a lightbulb sparked on inside my head. The lab was a place where my wonderful mentor Julie Beegle patiently guided me through tissue culture, gently reminding me again and again how to avoid contamination and never sighing when I bubbled up the hemocytometer, miscalculated transduction rates, or asked question after question after question. Despite being full of incredibly brilliant scholars with prestigious degrees and publications, the lab was a place where I was never made to feel small or uneducated, never made to feel like there was something I couldn’t understand. So for me, the lab became a place where I could unashamedly fuel my need to understand everything, to ask hundreds of questions until the light bulbs sputtered on and a spark, the same spark that had glowed in the eyes of my sister years ago, burned brightly. The lab became a place where it was always okay to ask why. At moments towards the middle of the internship, when my nerves had dissolved into a foundation of tentative confidence, and I had started to understand the words that tumbled out of my mouth, I’d be working in the biosafety cabinet or reading a protocol to my mentor and think, Wow. That’s Me. That’s me counting colonies and loading gels without the tell-tale nervous quiver of a beginner’s hand. That’s me explaining my project to another intern without an ambiguous question mark marring the end of the sentence. That’s me, pipetting and centrifuging and talking and understanding – doing all the things that I was certain that I would never be able to do. That’s the best thing that the CIRM SPARK internship has taught me. Being an intern in this wonderful place with these amazing people has taught me to be assured in my knowledge, unashamed in my pursuit of the answer, and confident in my belief that maybe I belong here. These feelings will stay with me as I navigate the next two years of high school and the beginning of the rest of my life. I have no doubt that I will feel unsure again, that I will question whether I belong and wonder if I am enough. But then I will remember how I felt here, confident, and unashamed, and assured in the place where I never thought I’d be. It was not until the end of my internship, as I stood up to present a journal article to a collection of the very people who had once terrified me, that I realized the biggest thing I was wrong about two years ago. I was wrong when I assumed that this was a place where I would never belong. Instead, as I stood in front of this community of amazingly brilliant and kind people, my mouth forming words that I couldn’t have dreamed of understanding a month ago, I realized that this was precisely where I belonged. This was the place for me. My fellow CIRM team members and I just got back from two days in Sacramento where we attended one of our favorite annual events: the CIRM SPARK Student Conference. SPARK, which is short for Summer Program to Accelerate Regenerative medicine Knowledge, is a CIRM-funded education program that offers California High School students an invaluable opportunity to gain hands-on training in stem cell research at some of the leading research institutes in California. 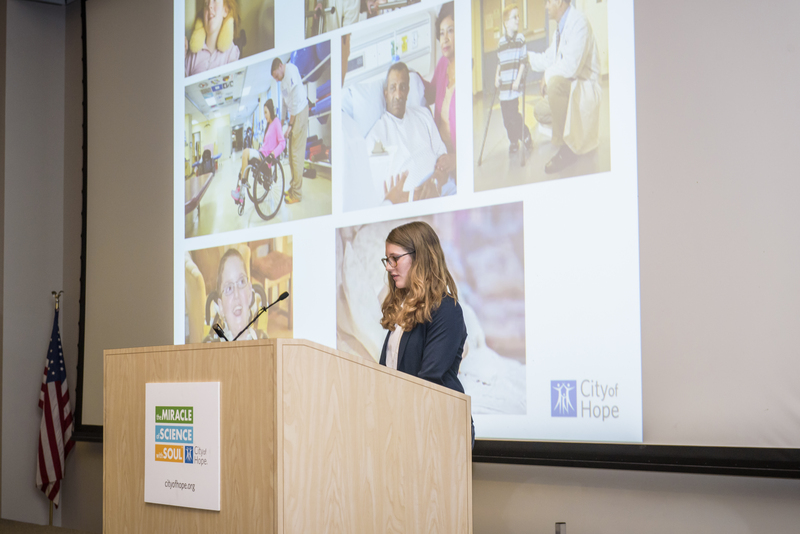 This meeting represents the culmination of the students’ internships in the lab this summer and gives each student the chance to present their project results and to hear from stem cell research experts and patient advocates. Every summer, without fail, I’m blown away by how much the students accomplish in such a short period of time and by the poise and clarity with which they describe their work. This year was no exception. To document the students’ internship experiences, we include a social media curriculum to the program. Each student posts Instagram photos and writes a blog essay describing their time in the lab. Members of the CIRM team reviewed and judged the Instagram posts and blogs. It was a very difficult job selecting only three Instagrams out of over 400 (follow them at #cirmsparklab) that were posted over the past eight weeks. Equally hard was choosing three blogs from the 58 student essays which seem to get better in quality each year. Being from Los Angeles, I began the SIMR program as a foreigner to the Bay Area. As my first research experience, I was even more so a foreigner to a laboratory setting and the high-tech equipment that seemingly occupied every edge and surface of Stanford’s Lorry I. Lokey Stem Cell building. Upon first stepping foot into my lab at the beginning of the summer, an endless loop of questions ran through my brain as I ventured deeper into this new, unfamiliar realm of science. Although excited, I felt miniscule in the face of my surroundings—small compared to the complexity of work that laid before me. Nonetheless, I was ready to delve deep into the unknown, to explore this new world of discovery that I had unlocked. Participating in the CIRM research program, I was given the extraordinary opportunity to pursue my quest for knowledge and understanding. With every individual I met and every research project that I learned about, I became more invigorated to investigate and discover answers to the questions that filled my mind. I was in awe of the energy in the atmosphere around me—one that buzzed with the drive and dedication to discover new avenues of thought and complexity. And as I learned more about stem cell biology, I only grew more and more fascinated by the phenomenon. Through various classes taught by experts in their fields on topics spanning from lab techniques to bone marrow transplants, I learned the seemingly limitless potential of stem cell research. With that, I couldn’t help but correlate this potential to my own research; anything seemed possible. However, the journey proved to be painstakingly arduous. I soon discovered that a groundbreaking cure or scientific discovery would not come quickly nor easily. I faced roadblocks daily, whether it be in the form of failed gel experiments or the time pressures that came with counting colonies. But to each I learned, and to each I adapted and persevered. I spent countless hours reading papers and searching for online articles. My curiosity only grew deeper with every paper I read—as did my understanding. And after bombarding my incredibly patient mentors with an infinite number of questions and thoughts and ideas, I finally began to understand the scope and purpose of my research. I learned that the reward of research is not the prestige of discovering the next groundbreaking cure, but rather the knowledge that perseverance in the face of obstacles could one day transform peoples’ lives for the better. As I look back on my journey, I am filled with gratitude for the lessons that I have learned and for the unforgettable memories that I have created. I am eternally grateful to my mentors, Yohei and Esmond, for their guidance and support along the way. Inevitably, the future of science is uncertain. But one thing is always guaranteed: the constant, unhindered exchange of knowledge, ideas, and discovery between colleagues passionate about making a positive difference in the lives of others. Like a stem cell, I now feel limitless in my ability to expand my horizons and contribute to something greater and beyond myself. Armed with the knowledge and experiences that I have gained through my research, I aspire to share with others in my hometown the beauty of scientific discovery, just as my mentors have shared with me. But most of all, I hope that through my continued research, I can persist in fighting for new ways to help people overcome the health-related challenges at the forefront of our society. School’s Out! Stem cells are in! High school students start CIRM-funded summer research internships. Robotic engineering, coding, video game design, filmmaking, soccer and swimming: these are just a few of the many activities that are vying for the attention of high school students once school lets out for the summer. But a group of about 50 high schoolers in California have chosen a different path: they will be diving into the world of stem cell biology. Each student earned a spot in one of seven CIRM-funded SPARK Programs across California. That’s short for Summer Program to Accelerate Regenerative Medicine Knowledge (yes, technically it should be SPARMK but we like SPARK better). The SPARK students will gain hands-on training in stem cell research at some of the leading research institutes in California by conducting a six-week research internship in a stem cell lab. Maybe I’m bias, as the Program Director at CIRM who oversees the SPARK programs, but I think they’ve made a great decision. Stem cell research is one of, if not the most exciting and cutting-edge fields of research science out there today. The pace of progress is so rapid in the field that a large workforce over the next century is critical to sustain CIRM’s mission to accelerate stem cell treatments to patients with unmet medical needs. That’s why the Agency has invested over $4 million to support over 400 SPARK interns since 2012. Yesterday, I had the pleasure to be in Sacramento to welcome the UC Davis SPARK interns on their first day of their program which is led by Gerhard Bauer, director of the Good Manufacturing Practice (GMP) laboratory at the UC Davis Institute for Regenerative Cures. The other programs, like the one at Cedars-Sinai in Los Angeles (see photo below), are also starting this week or next. Because everything we do at CIRM is focused on the patient, the SPARK programs are required to include patient engagement as part of the students’ internships. Here are some Instagram posts from last year that highlight those patient-centered activities. And speaking of Instagram, we have also included a social media component to the program. We believe it’s critical for scientists to connect with the public about the important work they do. During the UC Davis orientation, Jan Nolta, PhD, the director of the Stem Cell Program at UC Davis School of Medicine, pointed out to the students that making the science accessible and understandable to the public, makes stem cell research less scary and, as a result, it’s more likely to gain public support. So, as part of their curriculum, the interns will share a few Instagrams per week that capture their summer in the lab. You can follow their posts at #CIRMSPARKLab. In addition to communicating through photos, the students will describe their internship experiences by writing a blog. We’ll post the most outstanding blogs later this summer. In the meantime, you can read last summer’s winning blogs. At the end of their program, the students get to show off their hard work by presenting their research at the SPARK annual conference which will be held this year at UC Davis. It’s going to be an exciting summer! As part of our CIRM scholar blog series, we’re featuring the research and career accomplishments of CIRM funded students. Today, you’ll read about one of our former SPARK high school students. Emma Friedenberg and former CIRM SPARK Director Karen Ring at the 2017 SPARK Conference. Emma Friedenberg is a high school senior at Campbell Hall in North Hollywood, California. She’s also an up-and-coming neuroscientist who has her sights set on unraveling the complexities of the brain and discovering cures for degenerative brain diseases. Emma spent the summer of 2017 studying Huntington’s disease in the lab of Dr. Virginia Mattis at the Cedars-Sinai Medical Center. 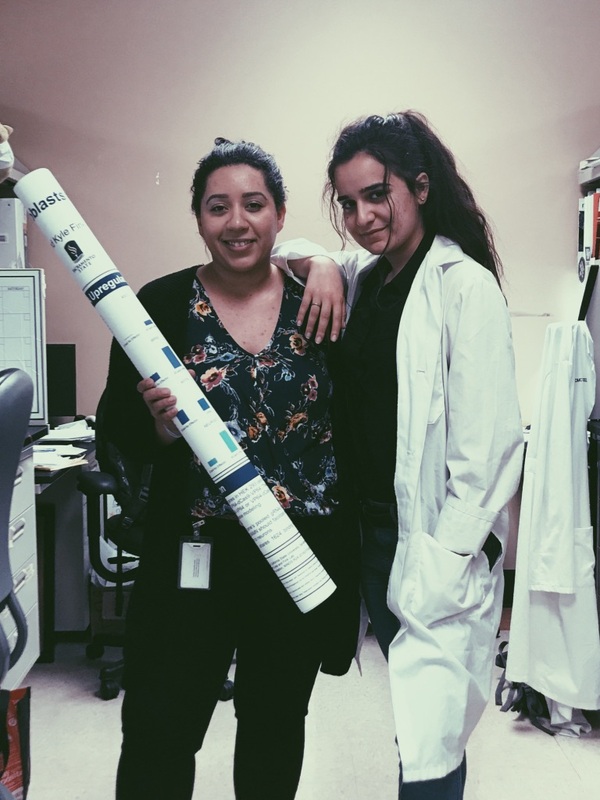 Her internship was possible because of the CIRM SPARK high school educational program which gives California students the opportunity to do stem cell research for a summer. 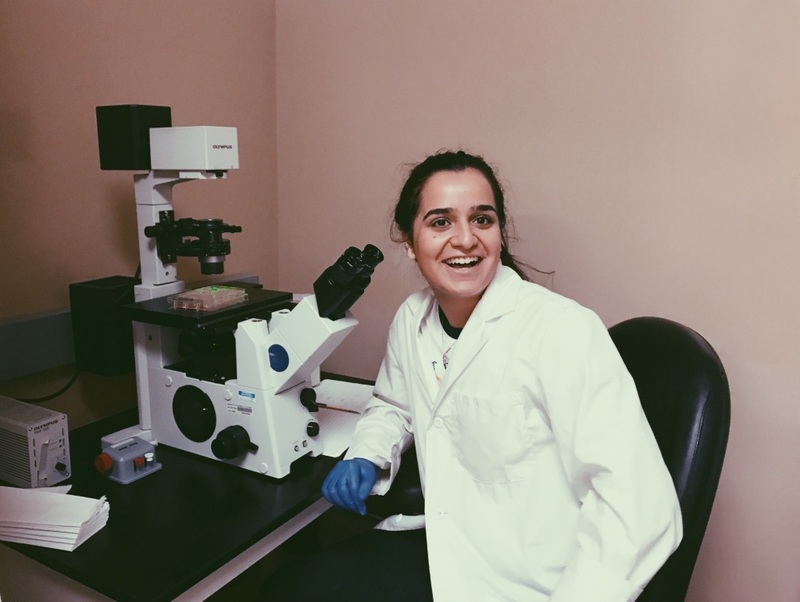 Below is an interview with Emma about her SPARK experience and how the program is helping her pursue her passions for research and medicine. Q: How did you learn about the CIRM SPARK program and why did you want to apply? I’ve been a clinical volunteer at Cedars-Sinai Medical Center for two years in the Intensive Care Unit and the Neurology and Spine Unit. I was submitting my application to return as a volunteer when I explored Cedars-Sinai’s Outreach website page and found the CIRM SPARK program. I knew immediately it was a perfect fit. I plan on studying neuroscience in college with an intention of obtaining my medical degree and becoming a surgeon. The CIRM SPARK program at Cedars within the Board of Governor’s Regenerative Medicine Institute had an option to be involved specifically in the Brain Program. In Dr. Virginia Mattis’ lab, I studied translational stem cell therapies for neurodegenerative diseases, in particular Huntington’s Disease. As Cedars-Sinai calls it, a “bench to bedside” approach is an unparalleled and invaluable experience and huge advantage in science. Q: What was your SPARK research project? At Cedars-Sinai, I was mentored by Dr. Virginia Mattis in her stem cell lab. 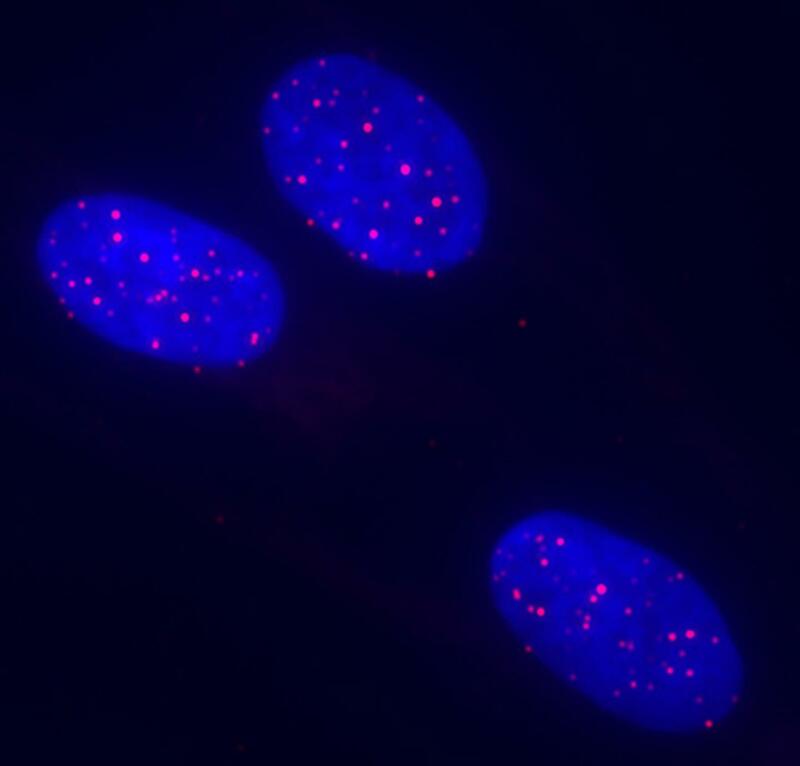 The Mattis Lab researches stem cell therapies for Huntington’s disease (HD), a neurodegenerative brain disease. HD is caused by a loss of neurons, specifically medium spiny neurons in the striatum of Huntington’s patients. 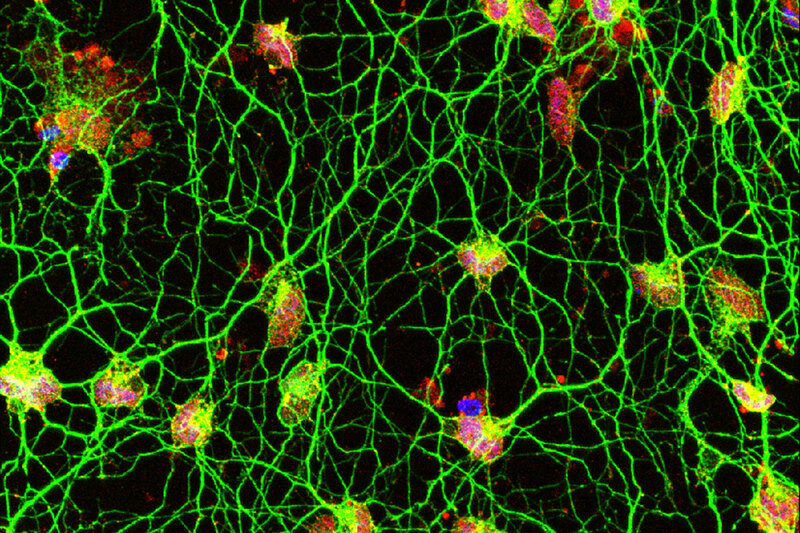 We used induced pluripotent stem cells to model HD in a petri dish to study the development of the disease and to create medium spiny neurons that could one day be transplanted into Huntington’s patients to replace lost and damaged cells. My primary research in the Mattis Lab was experimenting on our cell line to find the most time and cost-effective procedure to produce large populations of medium spiny neurons, because current methods are expensive and largely inefficient. However, my internship was not limited to the laboratory. I spent a significant amount of time shadowing doctors in the ALS Clinic. Q: What was your experience in the CIRM SPARK program like? In one word, the CIRM SPARK program was incredible –a one of a kind opportunity. The sciences are my personal passion and the cornerstone of my academic pursuits. The CIRM SPARK program has bolstered my scientific knowledge and provided practical experience in a real-world laboratory environment. A career in medicine is a significant commitment, and I’m confident the CIRM SPARK program was a beneficial start to obtaining my goals. Cedars-Sinai SPARK students celebrating the completion of their 2017 internships. Q: What do you value most about your SPARK experience? It was wonderful to be part of a program which understood collaboration and offered a plethora of learning opportunities outside of the wet lab. What I will keep with me is not only techniques of immunocytochemistry and microscopy, but also the advice and encouragement from accomplished scientists like Clive Svendsen and my mentor Virginia Mattis. I plan on studying neuroscience in college with an intention of obtaining my medical degree and becoming a surgeon. Q: Who is your scientific idol and why? I recently read Dr. Eric Kandel’s book, The Age of Insight: The Quest to Understand the Unconscious in Art, Mind, and Brain, from Vienna 1900 to the Present. Dr. Kandel is a neuroscientist and a Professor at Columbia University. He received the Nobel Prize for his work in memory storage using Aplysia, a type of sea slug. His book examines how the human brain responds to art. What I find so inspiring about his book is his interdisciplinary approach to science, a combination of neuroscience, psychoanalysis, biology, and art. The human brain is so complicated that it can be studied from numerous perspectives, from biology to chemistry to electrophysiology. It is not until we can begin to merge these understandings that we will begin to unlock the secrets of the brain. Dr. Kandel is not only a scientist, but an intellectual. For centuries, the human brain was an anomaly, unexplainable by science. With 100 billion neurons and 100 trillion connections, the brain is the most complex network in the universe. How the brain functions as an information-processing organ and regulates emotion, behavior, and cognition as well as basic body functions like breathing remains a mystery. In recent years, there has been significant progress in brain research. Scientists are on the brink of major breakthroughs, but there is significant work to do particularly on neurological brain disorders. Being a scientist means living on the cutting-edge of human innovation. I enjoy being able to both ask and answer questions that will benefit humankind.